In a perfect world, usability testing involves users who represents your project's target. For these reason, it is very important to know how to get this kind of users, and prevents some inconveniences for testing with incorrect personas. Screener questions prevents incorrect users in usability testing sessions, it consists of a multiple-choice questions that can either eliminate users from taking part in your study or give them access to it. How many times did you book a room in a hotel in the previous year? If the users answer with 0, probably this user does not have enough "booking experience" to test your website. However, In some usability testing sessions, you will need this kind of users "without experience". In my case, I assume that you will test a functional website, and lot of users know how to book in Booking, Expedia, or others. Provide clear and distinct answers, it will help both you and the user. Avoid leading questions. With this type of questions, users tend to answer what you want to think. instead of what users think. Provide "I do not know" or "Other" option. Maybe users do not understand some questions, and they will have the chance of answer with a "correct" option. Of course you will know if some question is confusing users, and change that for future screener questions. Always add a question related with recordings, some users do not want you ti record the session. Remember to create a consent document to sign. Finally, you should use Personas to create questions, you need to match your usability testing participants with your target audience. How many times did you [most important action in your website] last year? Demographics (if needed). For birth date, you should only need the year, not entire date. 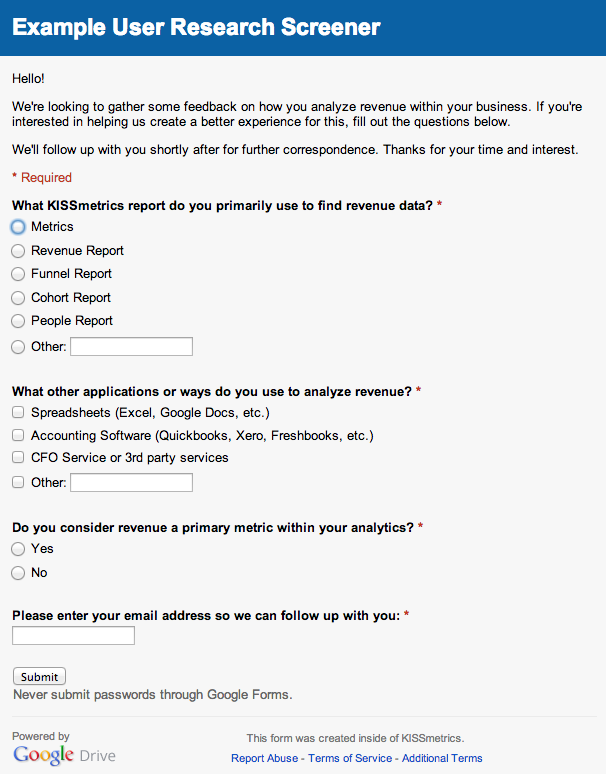 I recommend 3 tools for creating screener questions, two free and one paid. My recommendation is to start with free tools, and move to Ethn.io when you have more experience recruiting users. Is one of the most popular tools for intercept people in real context. It provides tools for intercept users (via popups), an easy way to create screener questions which you can share via email, social media and ads, and it has an App for Android and iOS. It has lot of advantages, but, as I said, my recommendation is to move to this tool when you are more mature recruiting users. And it is not cheap, the price is from 79$ per month. Google has a free way to create forms, you can take advantage of screener via Google. It is a good way to start if you are a beginner. You can export results in Excel to manage your results. 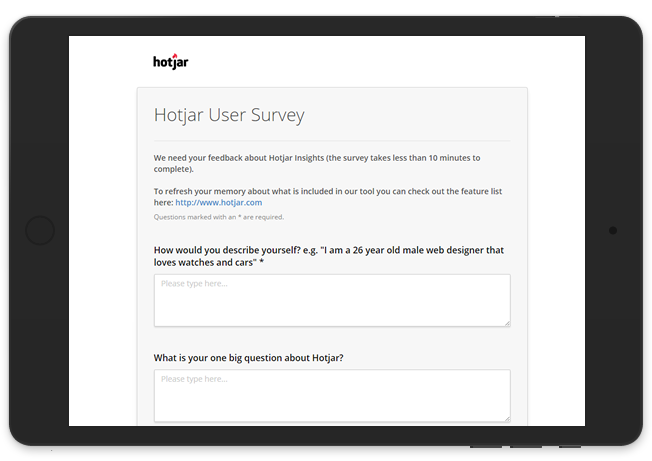 My recommendation is to use Hotjar because you can create surveys for free, and of course you can use Heatmaps and Session Recordings for free, limited to 3 Heatmaps and 300 Recordings. I tend to use Hotjar, it provides direct links to the surveys, I can export it in Excel to filter results. Finally, you can easily enable or disable surveys with one click. Screener questions is a very important tool for recruiting users, you need to test your project or product with your target, and screener questions will help you to get better results. Finally, remember that a screener is often the first interaction a user has with the research process at your company or client, and you want to ensure it’s a positive one. Provide context and clear expectations about next steps if they pass the screening: how does scheduling work, how long will they need to spend and where do the sessions take place, compensation, etc.